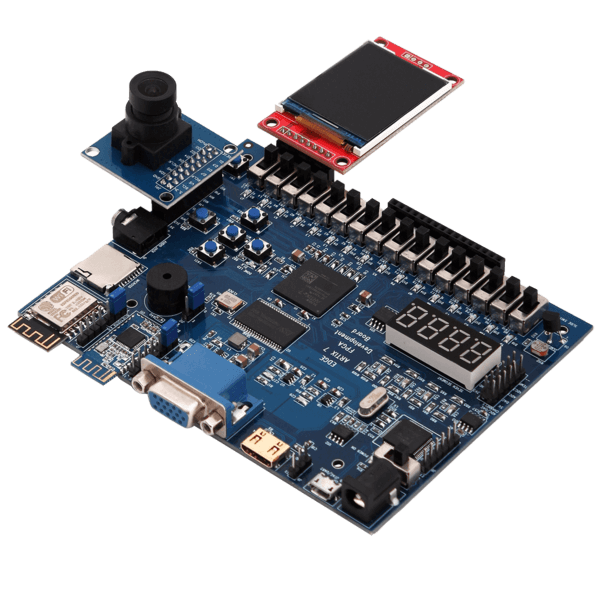 In this tutorial, We implemented 4 bit binary counter using EDGE Spartan 6 FPGA Kit. It counts at every 0.5 sec. We already designed 4 bit Binary counter for simulation which counts at input clock frequency (20 ns). As a result we can’t visually differentiate the counting sequence with on-board LEDs as it is counting at 20 ns. 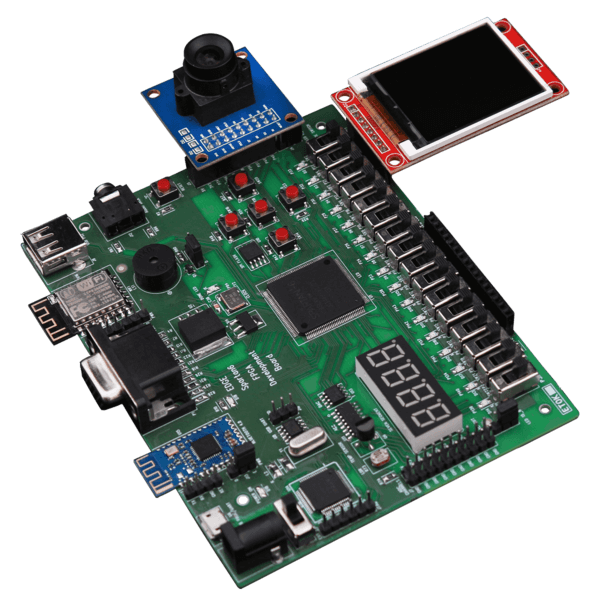 To implement it on FPGA first design the clock divider to generate 0.5 sec clock from 20 ns. Clock Divider takes an input frequency of 50MHz and generates an output of frequency of 2Hz. Next step, provide the clock divider output as a clock input to binary counter. 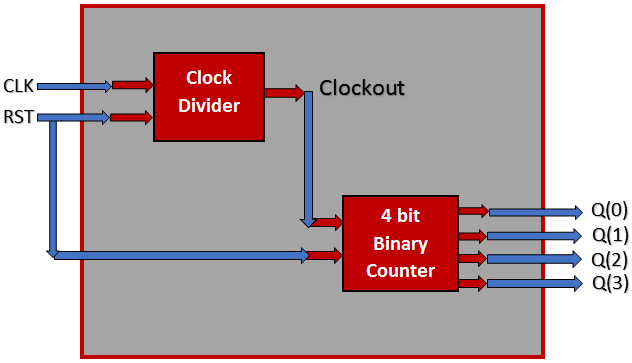 In this section, Top Level Binary counter VHDL code consist of Clock and Reset as input and 4 bit counter output. We port mapped clock divider and binary counter to the top madule in the following code. VHDL Code for Clock Divider from 50 MHz to 1 Hz. For more details refer the detailed article on Clock Divider. VHDL Code for binary counter at input clock frequency. 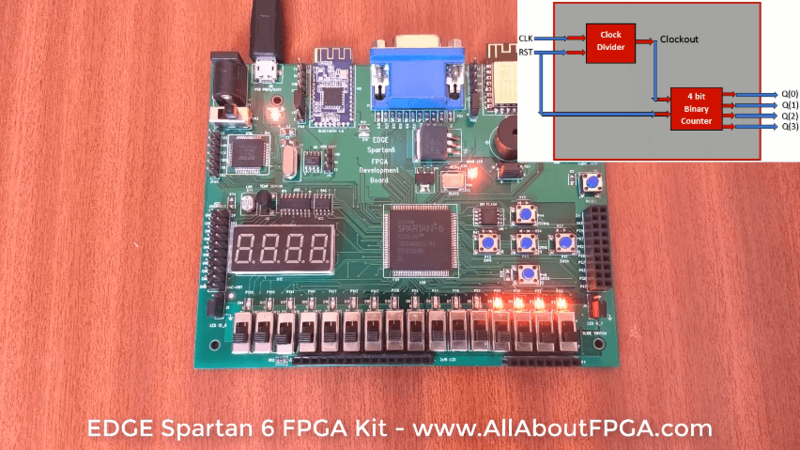 Our FPGA Kit got 50 MHz External Clock connected to Spartan 6 FPGA. To reset the circuit, SPDT Slide Switch SW2 is assigned. 4 bit counter output is assigned to LEDs D2, D3, D4 and D6.